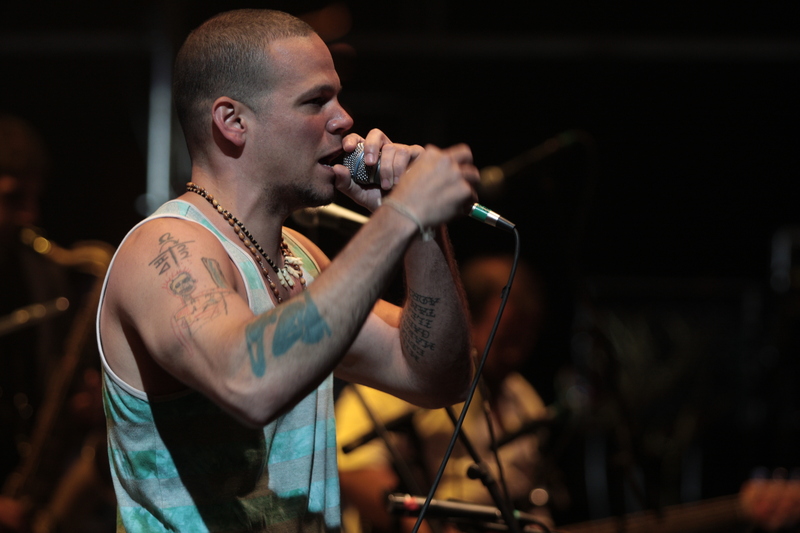 ‘René Pérez Joglar, aka Residente, from the Puerto Rican band Calle 13’ by Jorge Villa Moreno. I am afraid that Latin America is a decaying concept. I have had that feeling listening to Latin music for some years, the one that sounds in mainstream radios, the one awarded here and there by the industry. Very often, when I go over contemporary lyrics I wonder: where is Latin America? In this article I provide an answer based on the analysis of lyrics from popular songs composed in the last 60 years, identifying three stages: a first moment when composers talked about America as a continent; a second step when Latin America emerged politically loaded; and a third one when the word America –and the political load- was evicted to create a new identity, just Latin. To put it bluntly, I argue that Latin America (as a concept) has been kidnapped in music (although it sometimes wanders around as a fugitive reminder of an unachieved past). In the fifties and sixties popular music broadcast on radio stations, sold on LPs and played at music festivals, talked about America in a broad sense. These songs were about people and nations, united by a narrative attached to nature, including the green forest, rivers, waterfalls, flowers, hills and valleys. All of this existed in a context of harmony confronted to the brutality of the Spanish gun and fire that destroyed everything around. These songs of unity took elements of that nature to say that we were all just one: Americans, and that all singularities made the whole, but the whole was more than the sum of all of singularities. “Canción con Todos” (Song with Everyone, 1969) by the Argentinean composers Armando Tejada Gómez and César Isella reflects this feeling, speaking from the position of an imaginary inhabitant walking around the American countries: “I set out to walk across, the cosmic belt of the south/ I step upon the most fertile region, of the wind and the light/ I sense as I walk, all the skin of America in my skin/ And in my blood a river flows, that sets free in my voice its abundance/ Sun from high Peru, the face of Bolivia, tin and solitude/ Green Brazil, kiss my Chile copper and mineral”. This song carries on its naturalistic description a deep political sense rooted in the most basic condition of Latin – American situation: voice, presumably as a right of a sovereign land to name its name, to talk by itself, to not be subjugated by any master. “Sing with me, sing/ American Brother/ Release your hope/ With a scream in your voice!” continues the song. It is remarkable, however, to observe that the invitation to take out the voice -and the rest of the lyric- is directed to all American brothers. This call occurs because the songs of this era sing about America not as a national territory but as a whole continent -something that today might cause confusion. Here Latin America does not appear yet. In “Si Somos Americanos” (“If we are Americans”, 1965), another pinnacle song from the 1960s, Chilean singer and composer Rolando Alarcón depicts unity that defines a clear us (and therefore a clear them): “If we are Americans/ we are brothers/ we have got the same flowers/ we have got the same hands/ If we are Americans”. Here, the others (them) are described as those who are not close to dance “marinera, refalosa, zamba and son”, i.e. typical dances from the Andes, from the southern cone of South America, from the Brazilian area and from the Caribbean and Centre American axis. In other words, these songs do not consider the USA, Canada and other nations located on the same continent in their definition of America. Why? The answer is material for another debate, but let’s say that a narrow identity was in the making. A second moment appears Latin America, with an undeniable and clear political component. It shows up as a continent that, after the defeat of its emancipatory projects in the 60’s and 70’s, resists against the triumphant empire of 20th century: USA. Here Latin America is again a vegetal, human and mineral territory, inhabited by abused people and exploited resources, popular subjects that must resist if they want to overcome what seems the curse of their destiny. This is traceable from Mercedes Sosa’s song “Las venas abiertas”, (“The Open Veins”, 1985) until the most recent “Latinoamérica”, (“Latin America”, 2011) by Calle 13, among others. In “Latinoamérica” the Puerto Rican band sings: “I am/ I am what they left behind/ I am the leftovers of what they have stolen” before highlighting the natural spectrum of the continent and its dignity based on communitarian reciprocity: “Here we share, what is mine is yours” they declare. Particularly pungent, Los Prisioneros lyrics describe Latin America as an “exotic place to visit”, prepared for tourists purchasing trips to the Rio Carnival and the Aztecs ruins. A land plenty of natives who will sell themselves for a few dollars and, furthermore, cry if Ronald Reagan (the song was composed in the 1980s) or the Queen (from any European nation, obviously) dies. A loose sentence in the middle of the lyrics – “to divide is to weaken” – comes up as a key and permanent topic with political and historical consequences. According to Daniel Party, Miami not only “had become the heart of Latin American show business and the preferred production centre for Latin American pop artists wishing to internationalize their career” (65), but “[Miami] went from capital of Latin America in the United States to capital of Latin America” (66). Party’s assertion is an unavoidable argument on the historical journey proposed by this text as it points to a crucial shift: the capital of ‘us’ settled down in the land of the former ‘them’. ‘Latin America’ became a shorter concept: ‘Latin’. The obliteration of the ‘American’ part of the former compound word became a natural presence in contemporary lyrics recorded and distributed by mainstream music industry. It went so far as to receive coverage from ‘MTV Latino’, awards in the ‘Latin Grammys’ and available in the Latin channel of the music web http://www.accuradio.com. In this context, the identity of the ‘Latino’ appears as a US based story, as described in one of the songs by the Mexican band Maná: “Warning, this is a call/ Your attention is valuable, they are discriminating Latinos/ I think they are not right/ We are people that never cower/ We are going to show who we are with courage and value”. Even though the song is called ‘Latinoamérica’ (Latin America, 2011), the subject in the lyrics is the Latino who lives his/her Latino experience on US soil. Therefore, the Latino condition is a matter of individuals, subjects; not nations, countries or federations in a context where he or she can be discriminated not by his/her brother – like in the 19th century and part of the 20th – but by those who own the place where the Latino is a foreigner or a significant other. Nonetheless, in Maná’s song there is a trace of an historical claim, something that in most Miami styles of Latin music is not present. In most of the songs coming from the US, the Latin identity is a broad picture of wild nature, pretty bodies, frantic cadence, mystic secrets and spicy moods. The song “Mujer Latina”, (Latin Woman, 1997) by Mexican singer, actress and dancer, Thalia, is an example. The lyrics says she is the blood of her land “from sea to the mountains, hot like the fire”, while other songs just take the meaning of Latino to a whole new level. Like in Don Omar’s track “Reggaeton Latino” (Latin Reggaeton, 2005), where the power of Latin music is to make women dance for the pleasure of men. No revolution, no dream of a better world, no history, no heritage, just dance in this vision of the Latin landscape, men are machos and women are (or must be) hot. I am afraid – and with some degree of certainty due to the last football World Cup held in Brazil – that the less political, less emancipated Latino image, music and culture rather than a politically-loaded Latin America, will be the one occupying the global marquee in the next few years, especially in the context of the Rio 2016 Olympic Games. And this should not cause surprise. The opening ceremony of Brazil 2014 World Cup featured J-Lo, Pitbull and Claudia Leitte (to add the local component), and there is no reason to think that in 2016 the set will be different. Sure there will be frantic hips, vivid colours, ‘Latin words’ like olé or caramba plastic flavours, good feelings and the best intentions. That will be the global image and lyrics of the ‘Latin’ world emerging on the global stage. The notion of Latin America, on the other hand, with its uncertainties, peculiarities and untold discourses, will be behind that noise in the cracks of that industry, wandering around, trying not to be subsumed by the so called Latin music. Grosfoguel, R. (2007) The epistemic decolonial turn. Cultural Studies, 21 (2-3), pp. 211-223; Quijano, A. (2008) “Coloniality of power, eurocentrism, and social classification”. In Moraña et. al. (eds) Coloniality at large. Latin America and the Postcolonial Debate. Pp.181-224. Durham: Duke University Press. Party, D. (2010) “The miamization of Latin American Pop Music”. In Corona, I. and Madrid, A. (eds.) Postnational musical identities. pp. 65-80. Lexington: Lanham.